← What Makes Goblins Gobble? 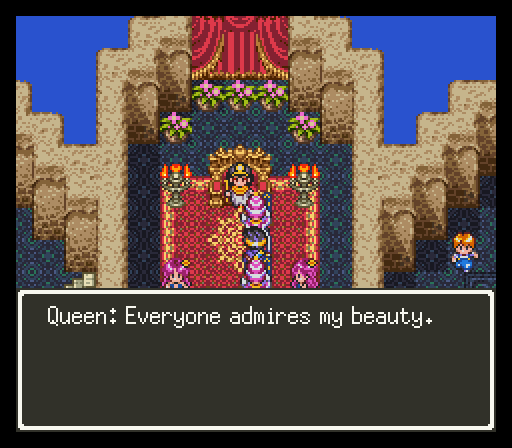 I’ve mentioned before how the world of Dragon Quest III is modeled on our own Earth, although there are some strange differences. 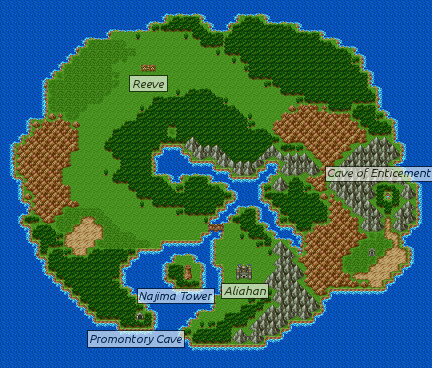 One of them is the lost continent of Aliahan, although that presumably refers to legends of Atlantis and Mu. There’s also the typical video game means of world navigation, where going all the way south brings you back to the north, a wrap-around that I wouldn’t know how to represent with a geometrical shape. Antarctica isn’t there at all, although there are the Antarctic islands of Luzami and Liamland. And in the Arctic, the island of Greenlad is considerably farther west of where our Greenland is. Not surprisingly, there are references to a lot of history and legends, although it doesn’t seem to reflect any one specific time period. The Queen of Isis is based on Cleopatra, who lived at the time the Roman Empire was being established. 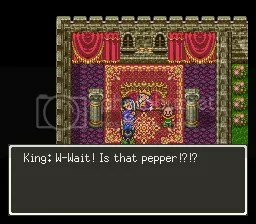 The King of Portoga has a passion for black pepper, which you have to travel to the Indian town of Baharata to retrieve. While there was spice trading between Europe and India back in Roman times, the most direct reference is likely to Spain and Portugal attempting to find a new trade route during the fifteenth century. Your heroes also play a part in establishing a colony in North America, located on the map around New York. There’s a queen named Himiko ruling in Zipangu, and the actual historical Queen Himiko ruled in Japan around the second and third centuries. I’m not sure Samanao has much to do with any actual places in South America, although it was the home of a hero named Simon, who might well have been named after the nineteenth-century Venezuelan leader Simon Bolivar. There are also stuck-up Brits in Edinbear, the tribe of the Soo in North America, the Indian Shrine of Dharma where you can change class, the Scandinavian town of Noaniels that’s been cursed by the local elves, and an Arabian city known for nightlife and belly dancing. This page explains some of the names, several of them being Japanese plays on words that don’t really translate into English. It seems a bit telling that, aside from the Egyptian kingdom, most of the locations on the African continent don’t seem to have real-world equivalents. Instead, Africa is the Necrogond, home of the Archfiend Baramos; and the only sub-Saharan human dwelling is a ghost village that he destroyed. I think it’s playing on the old stereotype of Africa as the mysterious and monstrous Dark Continent. I don’t see any particular cultural references in the Australian town of Lancel, either. It’s mostly there as an access point to the Navel of the Earth, named after a concept of a central location that I believe is Greek in origin. It’s not even central on the world map. There also doesn’t appear to be any regional variation in terms of how people look, with the exception of Zipangu, which has its own character sprites. So do the gods just like creating the same world over and over again, or is this some kind of alternate Earth that split off from ours due to the influence of Zoma or something? This entry was posted in Age of Exploration, Colonization of America, Dragon Quest, History, Japan, Roman Empire, Video Games and tagged aliahan, baharata, baramos, cleopatra, dragon quest iii, edinbear, elves, greenlad, himiko, isis, lancel, liamland, luzami, navel of the earth, necrogond, noaniels, portoga, samanao, simon bolivar, spice trade, zipangu. Bookmark the permalink.